Order your Porsche Design P'3140 Matte Black Twist Shake Ballpoint Pen today from FahrneysPens.com. Fine Pens, Refills & Luxurious Gifts – great prices & fast shipping. 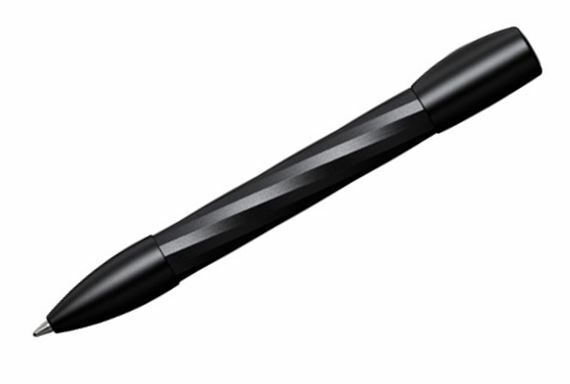 Porsche Design shakes things up with its P'3140 Matte Black Titanium Twist Shake Ballpoint Pen! With its extraordinary spiral form this shake-activated limited edition model of the popular pocket-size P'3140 is both elegant and sporty. The P'3140 has a solid aluminum barrel that is milled into a unique winding shape giving your hand an unexpected twist. This noteworthy ballpoint pen measures only 4 1/4 inches long making it the ideal pocket pen. The remarkable mechanism inside the P'3140 Shake is easily activated with a flick of the wrist - shake it again and the point retracts into the barrel. The dynamic engineering and sporty elegance of the Porsche Design P'3140 Shake pen will make it your constant companion!